The sauce can be prepared in advance and can be stored in the refrigerator like any salad dressing. If you like, you can roast fresh peppers and make it more authentic, however, roasted peppers that come in a jar work well since the sauce add plenty of flavor. Enjoy! Rinse and drain the roasted bell peppers, pat dry with a paper towel, cut into bite-size pieces, arrange them in a serving dish. To prepare the dressing, mince garlic with a garlic press. Place garlic, olive oil, lemon juice and salt into a food processor or a blender. Blend until it is smooth. It will thicken as it emulsifies. Taste to see if you need to add more lemon juice or salt. Add water and mix again. Pour dressing over the roasted bell peppers. Garnish with chopped walnuts. Serve chilled or at room temperature. This looks and sounds so delicious! I don't think I've ever tried this dish before. Going in my to-make list:) Thank you for sharing! Hi, my name is Yasemin. I love cooking, especially cooking with friends and family. I believe that some of the best conversations take place around the kitchen counter. Do you remember a time when you burned something right under your nose because you were in a deep conversation with a friend over a glass of wine or a cup of coffee? It happened to me many times and those are some of the most precious memories I have. 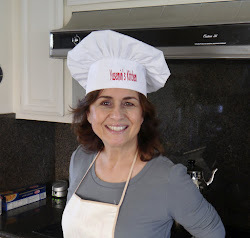 In my blog, I will share my favorite recipes and some stories from my kitchen and my life. Welcome to my home.